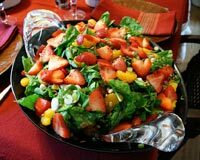 Strawberry Salad is a very popular recipe. Learn how to make/prepare Strawberry Salad by following this easy recipe. Dress 3/4-cup light mayonnaise, 1/4-cup milk, 2 tbsp poppy seeds, 2 tbsp raspberry vinegar and 1/3 cup granulated sugar. In a pan, melt 2 tablespoons butter; stir in 1/3-cup sugar and almonds and fry until golden brown. Here Sugared Almonds is ready. In a bowl mix strawberries, onion, lettuce and the sugared almonds. Mix dressing ingredients prepared in first step together in a small bowl and then toss with salad.